Orion is a large, striking constellation, with many bright stars. I have already written about Rigel, its brightest star. Of its other bright stars, Betelgeuse is 12th brightest in the sky, while Bellatrix is down there at 27th. Even if Orion itself didn’t have these bright stars, its nearness to Taurus (Aldebaran, Pleiades, Hyades) and the two bright stars of Gemini make it simple to find in the sky. Its size helps: it’s easy to see why the ancient Greeks saw their giant, the hunter Orion, in this constellation. As you can see above, Betelgeuse and Bellatrix are the giant’s left and right shoulders. Betelgeuse’s name is actually a mistranslation: Arabic Yad al-Jauzā’ was misread by medieval scholars as beginning with B. The name means “hand of Orion”. Bellatrix is Latin for “female warrior” and comes from Arabic Al Najīd, the Conqueror. Allen observes that this seems very freely translated. Other Arabic names for Bellatrix call it the Lion or the Conqueror. Both stars have connections to the movies, Beetlejuice being an obvious one, while in The Planet of the Apes the astronauts think they are on a planet orbiting Bellatrix, until the end reveals otherwise. Betelgeuse is a red giant so large that if it were our sun, its surface would extend at least to the asteroid belt, and possibly Jupiter. Its enormous mass means that it is burning through its resources rapidly, and astronomers predict it will explode in the next million years. And if that wasn’t enough, it’s also expected to crash into a wall of interstellar dust in the next several thousand years. 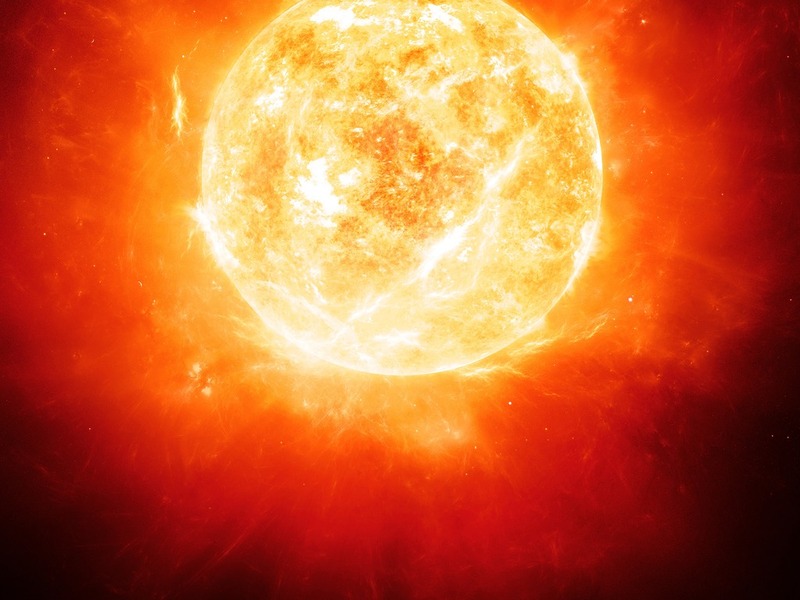 As you might expect from such an overheated star, its astrological nature is warlike, enjoying fighting for its own sake, influenced by Mars and Mercury. Like Sirius, there is some mystery about its colour; Ptolemy described its colour as “ruddy” (ὑπόκιρρος) while Chinese astronomers from three centuries before Ptolemy’s time called it yellow. It may have spent time as a yellow supergiant. The Inuit called Betelgeuse Ulluriajjuaq, “large star” because it was reddish and higher in the sky than Rigel, Orion’s ankle-star. The Inuit from Baffin Island and Melville Peninsula separated Betelgeuse and Bellatrix from the rest of the constellation and called them Akuttujuuk, “two placed far apart”. Betelgeuse is a reddish star, and one of the brightest, so it and Bellatrix became time-markers, since when they appeared on the horizon at twilight it was a sign that the days were getting longer. The importance of this in the land of the midnight sun (and consequent winter darkness) is obvious. Another myth about the two comes from South America: among the Amazon tribes Bellatrix is the Young Boy in a Canoe with an old man, the star Betelgeuse, chasing the Peixie Boi, a dark spot in the sky near Orion (also known as the Fish Mouth). Bellatrix is a variable star, which fluctuates a little in brightness. It is not, however, a binary star. 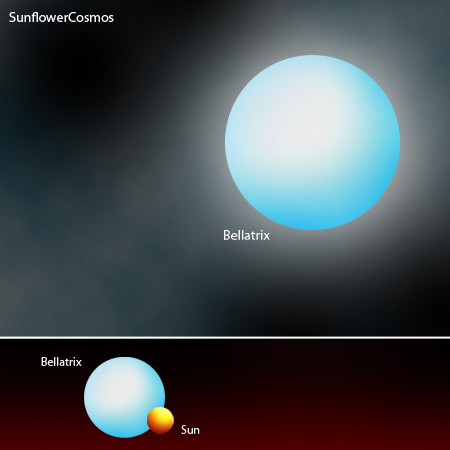 Bellatrix, in fact, is a very calm star compared to its near-supernova partner, and like our sun is expected to burn down to a white dwarf. Not how you expect a warrior to end. This entry was posted in Astronomy, Stars and tagged astrology, constellation, Orion on March 23, 2015 by solsdottir. Reblogged this on Believe The Realization Of Ewe..